"File fragmentation can negatively affect operating system speed and performance. To maintain peak performance when using Windows 2000, the condition of your disks should be analyzed on a regular basis�preferably once a week for moderate-to-heavy use; less frequently for intermittent use�and defragmentation performed as needed. Disk Defragmenter is designed primarily for stand-alone machines and users with Administrator privileges. It is not intended to be used for network defragmentation. Administrators who require network controls, automatic scheduling, and the capability to simultaneously defragment multiple partitions, and MFT and paging files, should consider upgrading to a third-party, networkable defragmenter." After the experience of 6.0 bringing my system to it knees (no data loss just intense CPU utilization) I wanted to make very sure the Second Edition was rock solid before recommending it to anyone. I have it installed in 2 Microsoft BackOffice SmallBusinessServer networks (1 SBS-W2K & 1 SBS-4.5) as well as a few stand alone systems. It has been flawless over the last 45 days since installation. I have been using the Set It and Forget It option to have the systems maintained to prevent the buildup of fragmentation. Running at the lowest priority setting I have not even had a complaint from a user about the network being slow. Keep in mind these servers are running the whole BackOffice Suite on one box so they are already overworked. There are 5 different settings for priority so you can tune your results for the automated de-fragmentation. There is another set of 5 priorities for tuning manual de-fragmentation. As I maintain these 2 test beds over the wire I find it very useful to be able to set and check up on all the workstations from the Diskeeper Server Console. New in this version is the �Smart Scheduling� option which when enabled allows the Diskeeper Engine to monitor fragmentation on the drives and schedule itself accordingly. It will run as necessary from every hour to only once a week. Of course you can manually set it to run at specified periods if you are a control freak. There are plenty of options Once, Continuously, 2, 4, 6, 8, 12, 24, 48 or 72 Hours. 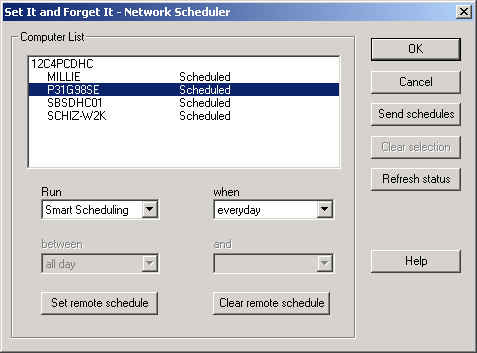 Here is a screenshot of the Network Scheduler, of course if you have the WorkStation Version you won�t see this. It is only included in the Server version. If you are already running Diskeeper 6.0 and not having any problems I would recommend downloading the Second Edition Free Upgrade from http://www.executive.com/downloads/menu.asp this upgrade requires that 6.0 is currently installed on the system. So if like me you had problems and un-installed it they will allow you to download the full product upon proof of purchase. If you have a slow connection I am sure they would send you out a new CD, you may have to pay shipping. I called and they gave me a temporary URL to download the full product with no hassle once they found my registration in their database. Compare Diskeeper� with the built-in Defragmenter in Windows� 2000. Once scheduled (by administrator), it runs as a service in the background independent of the user level log-in. Manual operation only. Can only locally defragment one drive volume on a machine at a time. Manual operation only. No scheduling capability. Full �Set It and Forget It�� automatic operation for any number of volumes/disks simultaneously across the network. Not available. Cannot be remotely launched or controlled. Superlative networking functionality. Can schedule groups of disks of any size on any and all disk volumes on computers, workgroups or domains throughout the network. Also enables direct connection to a specific computer on the network and remote execution of all Diskeeper operations including analyzing and defragmenting disk volumes, setting schedules, configuring exclusion lists and setting run priorities. Slow. Runs at normal priority and will go head-to-head with any application running at the same time. Fastest Windows defragmenter ever built. defragments drives much more thoroughly than the disk defragmenter in Windows 2000 -- and is able to do so 300 - 500% faster! High. System performance impacted if applications run during defrag. Low. Designed to run in the background unnoticed by end-users. Does not lock disk volume and runs by default as a low priority process. Yes. Can be run on one or more volumes simultaneously. Yes. Frag Guard helps prevent fragmentation in your MFT and Paging files, greatly reducing the need to defrag at boot time (see next item). Yes. 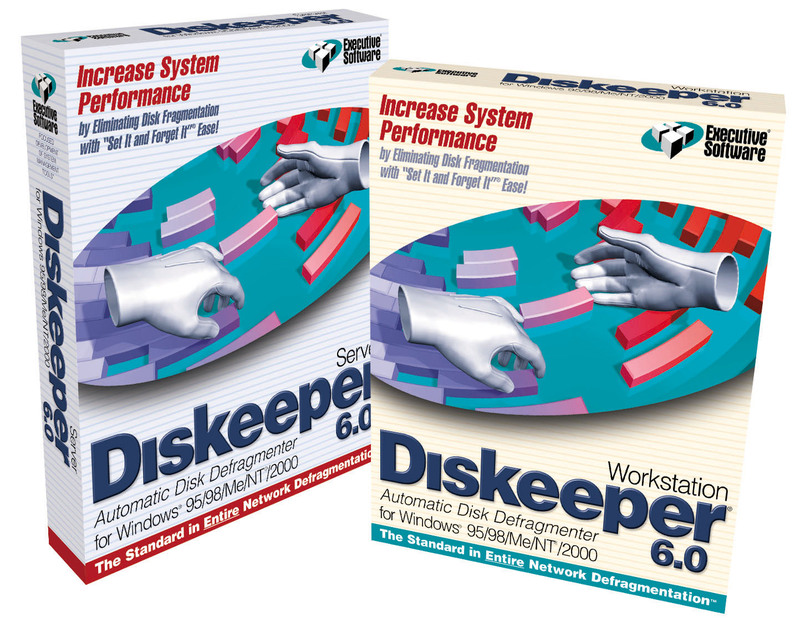 Diskeeper 6.0 Second Edition includes new boot time defragmentation technology to safely defragment system files in about the time it takes for a typical system boot � the only completely safe mode of defrag for these files. the Executive Software Logo & Diskeeper are trademarks owned by Executive Software International, Inc.
Microsoft, Windows & Windows NT are trademarks owned by Microsoft Corporation.